photographs & creates stunning videos of all of our HOT RODS & collector cars. ADDITIONALLY, HE PREPARES ALL THE “MOD LISTS“ FOR EACH VEHICLE & IS OUR RESIDENT EXPERT ON HOT ROD MODIFICATIONS. HE ALSO owns 3 “ FULLY MODIFIED SHOW CARS “ & IS VERY INVOLVED WITHT THE CENTRAL FLORIDA CAR SHOW SCENE. FINALLY, HE IS KNOWN AS A TRUE GENTLEMAN & ONE OF THE NICEST GUYS IN THE BUSINESS. SHE MANAGES THE PROCESSING OF EACH OF OUR VEHICLE DEALS … AND … REMAINS IN CONSTANT CONTACT WITH EACH CUSTOMER THROUGHOUT THE PURCHASE PROCESS. SHE ALSO RESEARCHES OUR VEHICLE PURCHASES & EVALUATES EACH TRADE. ADDITIONALLY, SHE MANAGES OUR 7 NATIONAL ADVERTISING SITES AND POSTS EACH OF OUR VEHICLE LISTINGS. OUR CUSTOMERS LOVE WORKING WITH LOREANNA. IN ADDITION TO BEING LOREANNA’S BOYFRIEND [FOR THE PAST 5 YEARS] … AND … ALSO BEING ENROLLED AS A FULL-TIME MECHANICAL ENGINEERING STUDENT AT UNIVERSITY OF CENTRAL FLORIDA; ISMAR WORKS WEEKENDS RECEIVING NEW ARRIVALS AND TRADES. JEFF IS A MASTER MECHANIC WITH OVER 30+ YEARS OF EXPERIENCE BUILDING, ALTERING, FABRICATING AND REPAIRING HOT RODS & CLASSIC CARS. 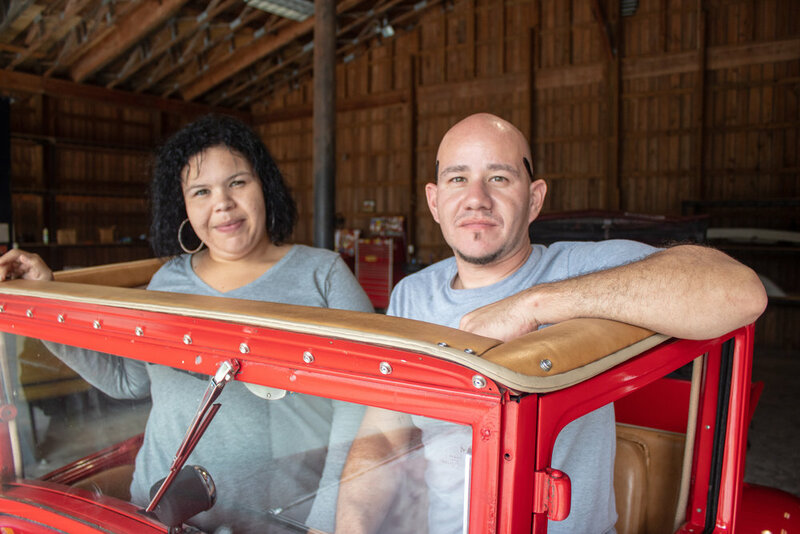 BEFORE JOINING THE FSD HOT ROD RANCH, HE SPENT THE LAST 12 YEARS WORKING FOR A NATIONALLY KNOWN RESTORATION SHOP & HAS BEEN INVOLVED IN MANY PROJECTS THAT RESULTED IN NATIONAL AWARDS. HE IS MOST PROUD OF A COMPLETE RESTORATION OF A RENOWNED DUESENBERG THAT ENDED UP ON THE GROUNDS OF THE WORLD FAMOUS “PEBBLE BEACH CONCOURS“. JEFF IS AFFECTIONALLY KNOWN BY THE FSD FAMILY AS “UNCLE JEFF“. KEITH IS A RETIRED USED CAR DEALER AND NOW TRANSPORTS HOT RODS & CLASSIC CARS FOR THE FSD HOT ROD RANCH. HIS CAREFUL PICKUP AND DELIVERY OF OUR VEHICLES MEANS EVERYTHING TO OUR BUSINESS & OUR CUSTOMERS. HE IS A VALUED MEMBER OF OUR EXTENDED FAMILY. ray is one the best in central Florida when it comes to detailing. he and his wife, Stephanie, are the main reason why our cars look so good and have a show quality mirror finish.